No QUESTION! ~~ PURPLE it is! Entire collections of “magnitudinous” proportions can be built around this wonderful color! 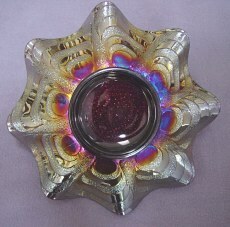 We have viewed some extensive displays of it during carnival glass conventions. The best compliment to its magnificence: No matter the pattern, the shape, or size of the piece, great care and expertise was applied to the iridization process! It would be difficult to find a poor example of purple Imperial. If a single pattern exemplifies the carnival glass contribution provided by this company, then IMPERIAL'S GRAPE could well fit the description. Nearly everyone recognizes its beauty, yet overall, the pattern is given little credibility by many collectors. Old catalog ads refer to this piece as a vase, while collectors of our era have always called it a water carafe. Having no stopper, it has the appearance of some carafe's seen on nicer restaurant tables through the `40's. Rare amber examples, along with green, helios (a name applied to a watery green shade, known to be of Imperial manufacture), along with marigold and smoke colors are available. RIPPLE vases are popular in many different heights, as well as standard to funeral size bases. The shorter 7 ½” size shown does display the design quite well. 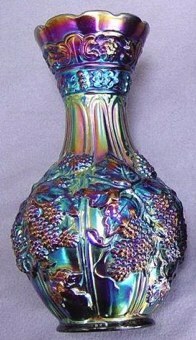 Throat extensions on some of the larger size vases can be overwhelming and spread to as much as 8” across the opening. Several dozen various sizes, depending on the swinging effort put forth, are out there for your satisfaction. Blue ones are very rare, white is scarce, along with 5” or shorter in purple, but most other colors are fair game. The Doty Field Guide to Carnival Glass (vase section) and the Doty website offer a range of size and color combinations. COBBLESTONES is a standout in any collection! The one shown offers more red tones than some. These 9” ruffled bowls are not often traded, so prices can vary widely….up to $850 for a super example. Marigold is seen less often, with reports of amber, helios and blue bowls. We have seen a flattened version, called a plate. However, the edges are not uniformly flattened. Whether it can be termed a “true” plate can be determined by interpretation. Cobblestones should not to be confused with a pattern from Fenton called Pebbles. ARCS exterior pattern is exclusive to Imperial. The stippling compliments the overall effect of the Cobblestones pattern. LOGANBERRY vases make a statement all their own! 10 inches in height, with 3 ½” base, the OLD vases have a starred base. Some of the new ones carry the IG identifying mark. Others have been tampered with by grinding and smoothing off the mark, left with a slightly stippled place on the bottom to cover up the alteration. Some with perfectly smooth bottoms may be old. Many an auction passes without an example of this pattern. When a hugely popular old purple one appears, $2500 and up is the price to expect. Amber, green, helios, marigold and olive are additional colors to search for. 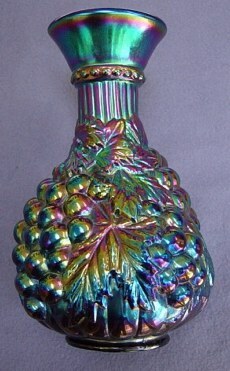 This is another of those carafe/vase type “combination” pieces, like the Imperial Grape in the same shape. POPPY SHOW does very well standing alone in all its 12” of glory! This is not the same design of the same name, as seen on the Northwood bowls and plates. Marigold is said to be the most common color. Smoke and smoky lavender, along with helios are known, as well. Purple is the scarce color in these vases and they will fetch around $4000 when amply clad with fiery color! Reproductions should be marked with the IG. 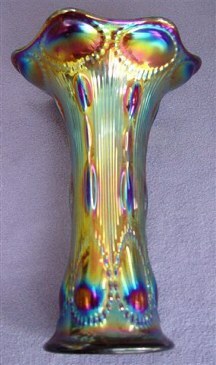 Using the original molds, Fenton continues to produce iridized examples in non-traditional colors for Singleton Bailey. 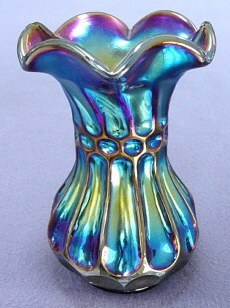 We recently purchased a gorgeous cranberry opal iridized vase in this pattern. 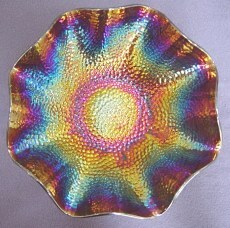 There are numerous base colors available including iridized Burmese glass. COLONIAL LADY is an undisputed “prize”. These 6 ½” classic beauties are not easily found in either marigold or purple, but they are equally lovely. Rib and Panels blown vases from an unknown manufacturer have similar ribbing, but should not be confused with this Imperial vase. We observed a purple Lady sell for close to $2000 this year at one of the Wroda sales in Columbus, OH. There had not been one sold for a long while, and determined numbers of bidders tend to drive prices. A marigold vase is known to have a special flare on the opening. We have seen a purple vase with three extra cut-aways from the ruffled top, possibly to “correct” a chip or two in that area? 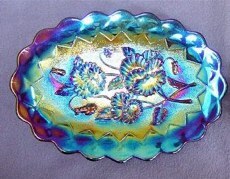 PANSY Dresser Tray in purple was shaped from the ruffled pickle dish mold. Oval and quite flat, they carry a lovely Quilted Diamonds exterior design, as found on the single handle nappies in this pattern. Marigold, purple, helios- (typically silverish), clambroth, and amber are the other colors found. This is one of the rarer shapes in this Pansy pattern, and the few purple ones we have seen over the years have unsurpassed iridescence! 9” bowls, (having the Arcs exterior pattern), and two piece breakfast sets comprise the other known shapes in this pattern. 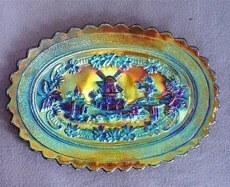 WINDMILL Dresser Tray was fashioned from the pickle dish shape, as well. 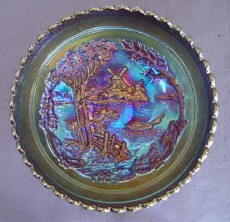 These trays are very scarce in any color, with helios most frequently found. Marigold trays follow closely in numbers. Aqua trays are known, with the purple ones rarely found. The example shown has the glaze treatment found on some Imperial pieces. $500 and up would be a “nominal fee” for either of these trays if one could be located. Watersets, and a milk pitcher in purple are downright impossible to get a clutch on. We passed on a damaged purple milk pitcher along about 1981, which belonged to the late Bill Carroll of Los Angeles. One has not come into view since. Incidentally, this is a great place to let you know that avid carnival glass collectors have been around for a long time. When Bill passed away in 1983, John Woody sold his carnival glass for three days in St. Louis! ……………More than 3,000 pieces of glass changed hands. Bill was part of the “Canadian Connection” from the `50's and 60's time frame. Along with some “pickers” in the New England area, this “group” would cross into Eastern Canada every summer and make some wonderful “finds” across the border. Bill NEVER met a piece of carnival glass WITHOUT MERIT!! Every piece was valuable in his eyes! He was GOOD for carnival glass! A man of the hour. California collectors in the `60's-`70's period, benefited from that “ connection” and the bounty Bill would take home with him. 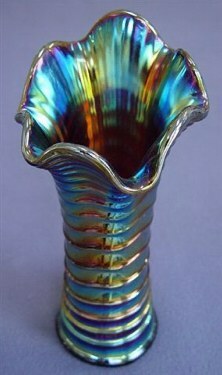 He was one of the pioneers forming the Southern California Carnival Glass Club more than 30 years ago. HEAVY GRAPE NAPPY has only a single handle. Scarcely seen in any of the known colors: marigold, purple, helios, and olive. Gracefully sloping sides reveal a lovely quilted interior pattern. 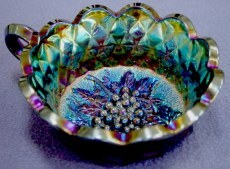 Of course, the pattern Heavy Grape is encountered fairly often in bowls of 5”-6”, 7”-8” and 9” to 10”, with smoke and emerald green as additional colors in the two smaller sizes. Fewer than six examples in cobalt blue are known in the 7”-8” size bowl. Light blue and cobalt examples of the larger bowl are known, as well. Plates in 6”, 7”-8”, along with chop plates 11”-12” in marigold, purple, emerald, helios, amber, smoke, white, green and ice green can be found, along with punch sets and cups in the basic colors. Imperial's Flute pattern #700 is the exterior design used on Heavy Grape pieces. DOUBLE DUTCH is a pattern found on footed 8”-9” bowls having two windmills in the pattern, whereas Windmill, per se' offers a singular windmill in the background. Smoke examples are difficult to locate, along with purple and emerald. Quite a few are seen in marigold. 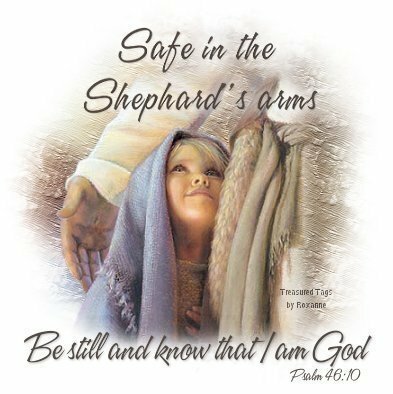 Helios and amber have been reported. A spittoon whimsey of this pattern is in a Wisconsin collection. There may be minute differences in the pattern from that found in Windmill bowls, but we shall leave that to your discretion. FLORAL and OPTIC provides the base mold for Double Dutch bowls, having three short, stubby hexagonal feet, which in most cases have been “dinged” a little over the years, or perhaps were damaged when removed from the glass mold? There are Floral and Optic bowls from Imperial, having plain interiors, as well. On occasion, a very nicely flattened chop plate becomes available. Combining these two patterns into one bowl, provides a very pleasing outcome. Pattern collectors call it a “good thing”! THUMBPRINT & OVALS Not in the rarity classification awarded the Three Row Vases, or perhaps the Colonial Lady for that matter. However, we must grant this charming 5”-6” beauty its claim to fame! It is another fine example of the stunning purple iridescence Imperial is noted for. The marigold vases are quite breathtaking as well. Opportunity to place one in your collection should not be overlooked. Impressiveness is provided in small pieces from time to time! 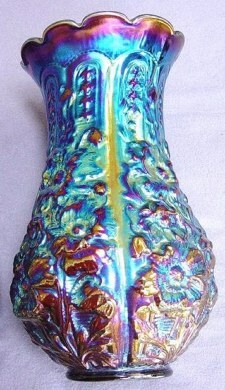 The flash of color emanating from this vase is unbelievable! BEADED BULLSEYE These “standards” among vase collectors can be found in heights of 6” - 14”. Some of the openings are distended or flared to nearly flattened positions, particularly on shorter vases. Marigold, purple, helios, smoke, amber, lime green, cobalt blue, and green and teal can be found. Base diam. is approx. 3 1/8”. A 20-point star is revealed in the base. Amber, green, and lime green are the scarce colors. 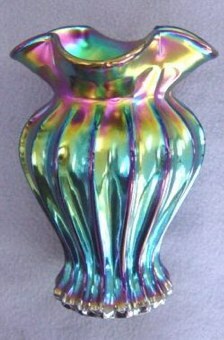 Purple examples can be richly endowed with rainbow color, such as this one shown, having great red and bronze highlights found when the glaze treatment was applied.